« Things I’ve learned from Pintrest..
One of the (many) things B has taught me about food over the years is that broccoli on sandwiches can be delicious. This lesson was passed on by through B from his grandfather. His grandfather was a very good cook, even though he used a lot of oil in everything. He used to send a batch of broccoli rabe out to B (and, in effect, me). With this, B introduced me to broccoli and provolone sandwiches. I had never been introduced to broccoli rabe let alone broccoli rabe sandwiches. I was hooked. When we stopped getting that shipment we started experimenting with making it ourselves. One thing we cut back on was the amount of oil (see above comment). 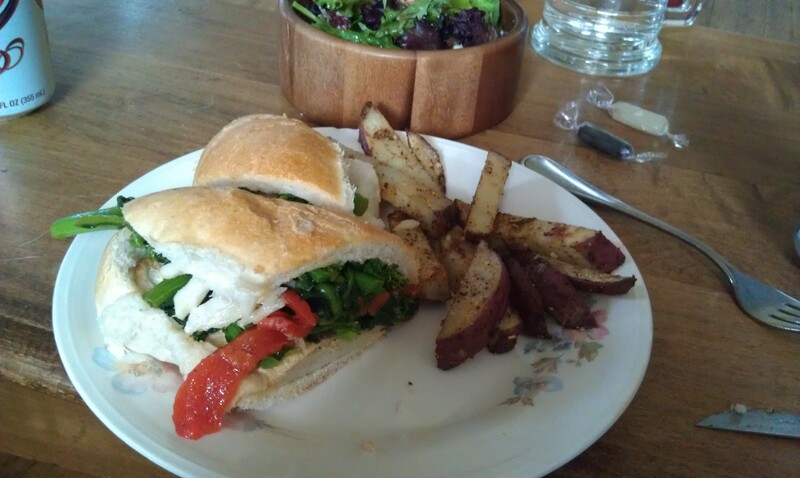 As B started eating meat again after we got engaged, we starting incorporating chicken, roasted long-hot peppers, and other things into these sandwiches. When B’s parents came to visit we decided to treat them to these sandwiches for lunch on their last day here. We decided to match them with homemade herb crusted fries with basil and roasted garlic mayo. This side dish was inspired by the frites at Park Brugge, which are matched with roasted garlic mayo, and at Point Brugge, which include basil mayo, restaurants in the Highland Park and Point Breeze neighborhoods of Pittsburgh, respectively. I’m not going to post this recipe because it was essentially all the taste. The basic steps are: cut potatoes, coat with herbs to taste, bake for a while, then sprinkle grated Parmesan cheese and broil for a short while; roast garlic, cut basil, combine mayo, basil, and roasted garlic to taste, add salt to taste. (1) In a large pot, bring water to a boil. Add broccoli rabe to boiling water and boil for approximately 3-4 minutes. Prepare a bowl of ice water and blanch broccoli rabe after removing from boiling water. Set aside. (2) Preheat oven to 350F. Prepare chicken tenders by making sure they are very dry and then seasoning with salt and pepper to taste. In a large pan, add 1 tbsp of olive oil and saute garlic. Sear chicken tenders approximately 3-4 minutes on each side. Place chicken tenders in a baking pan sprayed with non-stick spray and finish chicken in oven for approximately 10-15 minutes or until juices run clear (For Quorn, just sear the cutlet). (3) In a large pan, saute remaining olive oil, garlic, roasted red peppers, and salt and pepper to taste. Add broccoli rabe and saute for an additional 4-5 minutes. (4) To serve, add broccoli rabe over chicken on the sub/hoagie roll. Top with shaved sharp provolone cheese to taste.